Play Bonanza Slot Online with 500 Free Spins! 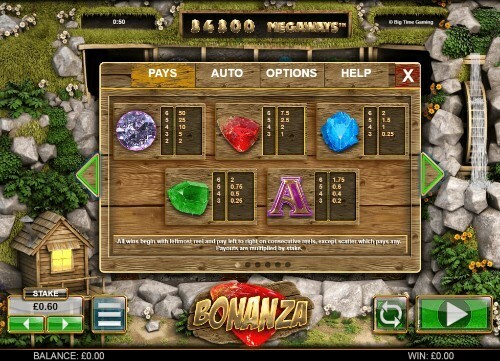 Bonanza is a 7x8x8x8x8x7 layout Online Slot Game by Big Time Gaming. Each reel alone or with a cart can have up to 7 symbols. Each spin can have up to 117648 Megaway to win! £1,000 vs Bonanza - 100 x £10 Spins! Watch one of the biggest wins recorded on Bonanza at Rose Slots as the Bonus round is triggered! 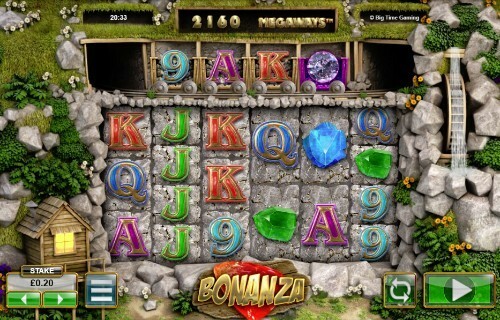 Bonanza online slot game is a gold mine themed blockbuster game from the super brains at Scientific Gaming. This UK slot game has really made an impact in the industry with its innovative 117649 Megaways to win! Big Time Gaming is the creator of this slot machine that comes with unusually big numbers. You may have heard of them less but their work stands shoulder to shoulder with any other video slot creator in the market today. Coming with great graphics and rewards, they have a large base of loyal fans all over the world. Danger High Voltage slot and Queen of Riches are two such very popular video slots developed by Big Time Gaming. But if you are a fan of gems and mining then Gem Rocks slot game created by Yggdrasil would be another game worth of having a look at. But girls, whatever your preferences are, one thing is sure: RoseSlots has your favourite online slots in its games library. The reels of the Bonanza slot machine is independent of each other thus carrying different numbers of symbols on each of them at a time. This game comes with 117649 Megaways to win at an RTP of 96%. It has 6 reels in the main window, and the winning symbols crush and fall allowing other symbols to fall in their place creating more winning combinations. The top value gem comes with 50, 25, 10, 5, and 2 coins when you land 5, 4, 3, or 2 of them on a Megaway. These numbers may look small but remember that this game has a 6 figure ways to win which means a win comes your way more often than you would expect. The good thing about this game is that you can play it a long time without big losses as would have been the case with many other standard slots. Bonanza slot has a Wild symbol that stands for all symbols except for the Scatter. 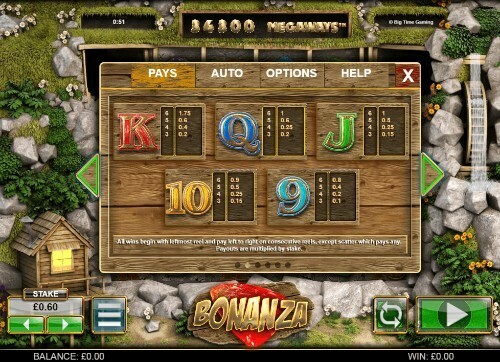 Bonanza is a 6 reel slot game with a special dynamic top row that creates up to 117,749 payline combinations. It's a little complicated at first to understand what is going on but basically all wins are awarded from left to right and any adjacent symbols will payout regardless of the size of the symbol so long as there is a combination match of at least 3 matching symbols on a payline (or 2 symbols for the purple diamond which is the top value symbol). With the avalanche of rocks you will find many precious stones coming your way as you spin them on this rather massive video slot machine that has a lot more than just 5 reels. A 6 figure payline count could be unbelievable, and up to 7 rows of symbols could sound like a lie but they are all true about the Bonanza slot machine. All RoseSlots ladies are invited to check this out. The Cart Row - The Carts add an extra dynamic symbol to each reel to create additional variety to the possible winning combinations. All winning combinations explode and the spaces will be filled by the symbols that fall in from above, this is called "Reactions"
Bonanza is all about gem and diamond mining, and you will see the mine carts in action bringing you gems of all sizes as you dig deep into the rocky mountain. But the most attractive thing about this video slots game is its graphics which is highly admirable. Designed with care, the symbols and the background have beautiful colours and animated symbols that would keep the player entertained the whole day. This is the kind of design that lures you to play yet another game. There are carts that bring special symbols to drop on the reels 2, 3, 4, and 5. Each winning symbol will be a part of a reaction and be replaced with a symbol from the carts. The Scatter has letters that make up the word GOLD, collecting which you will be awarded 12 Free Spins. Any additional Scatter would add 5 extra Free Spins to the mix. All this is coming with an Unlimited Win Multiplier. Every reaction after a win would add to the Unlimited Win Multiplier which could go up as long as you continue to win.